Here at DeckStainHelp.com we take pride in the fact that we have become the Internet’s number one resource for all things exterior wood and deck restoration related. As years before, our customers who have used TWP wood and deck stain continue to be satisfied by the appearance and longevity of their deck stain projects. If you have used TWP wood and deck stain in the past, or if you are using it for the first time this year, we appreciate your input, so feel free to leave a comment below and pictures of your completed projects if you have them. Important Note: This is an updated 2019 TWP 1500 Series Review. 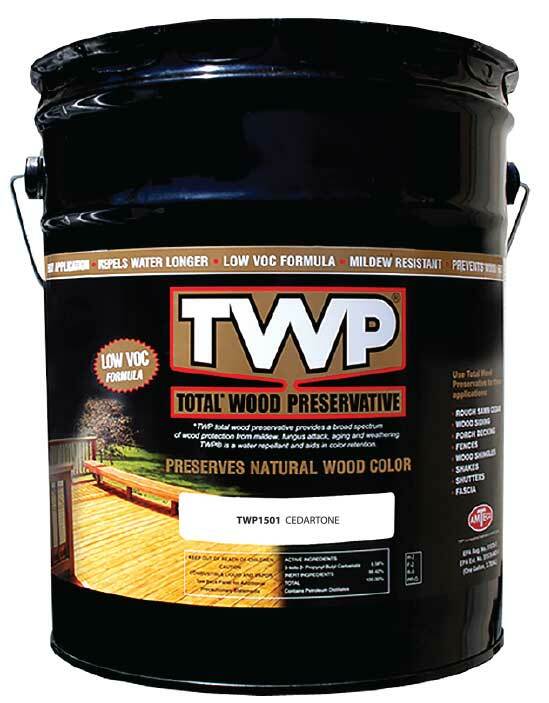 TWP® (Total Wood Preservative) 1500 Series Deck Stain was brought onto the market in 2010 as the permanent substitute for TWP 500 Series. TWP 1500 Wood and Deck Stain is a semi-transparent, oil based, EPA registered wood preservative. TWP 1500 Stain is specially formulated to use on all exterior wood surfaces. Its outstanding UV resistant blend prevents wood graying and discoloration. It is commonly used on decks, fences, log cabins, wood siding, and cedar shakes. It is offered in 10 shades that enhance the natural beauty of the wood. – The appearance of TWP 1500 Wood Stain on our test deck was a warm rich finish. The wood grain was enhanced and highlighted effortlessly. The 1501 Cedartone color was a little browner (not as orange) than a conventional cedar stain color. Update Best New Deck Stain for 2019: In 2018, our first full year if using the Restore A Deck stain, we had zero issues with performance and saved a tremendous amount of time with the ability to prep and stain in the same day. We will continue to offer the Restore A Deck Wood Stain as one of our go-to decking stains for the 2019 restoration season. With more than 20 years’ experience owning and operating our own deck staining business, we have tried pretty much every brand of deck stain out there. We Q&A with thousands of contractors, homeowners, and project managers about their projects, what works, and what does not. 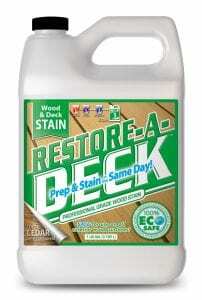 Last year we tested the Restore-A-Deck Wood Stain. The RAD stain completes the line of the RAD Cleaner, Strippers, and Brighteners that have been around for 15+ years. Restore-A-Deck wood stain utilizes the latest advancements in wood stain technology to properly seal and protect the wood in 4 beautiful semi-transparent finishes. The formula penetrates deep into the wood grain to protect your deck against UV damage and water that can promote the growth of mold and mildew. It is eco-safe and easily cleaned up during the application process with soap and water. After one year, the deck stain had no wear/tear and peeling, no mold/mildew/algae, no UV graying, and very little color darkening. We appreciate you visiting Deckstainhelp.com as we continue to be your go-to source for the latest in deck restoration news and trending topics through 2019. If you are looking for honest deck stain ratings, look no further. We base our ratings from our personal experiences as well as the input from thousands of project managers. Feel free to leave a comment below about your water-based deck stain of choice. With a lot of water-based deck stains on the market today it can be difficult to find the best one for your deck stain project. 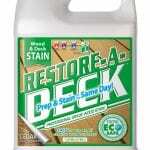 Looking at the reviews for the best water-based deck stain, one stands in a class by itself. 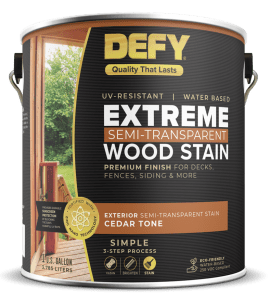 Defy Extreme deck stain is a newly blended formula using nano particle technology that improves stain performance by 200%-600%. Nano technology uses nano particles and synthetic resins to significantly increase the stain’s functionality. This synthetic resin-based deck stain blocks and absorbs harmful UV rays like a sunscreen. This technology is a first in the industry. Blocking UV rays is crucial to protecting the wood. Sunlight can gray out and fade decking. It can also dry out the natural oils of the wood jeopardizing the wood’s longevity. 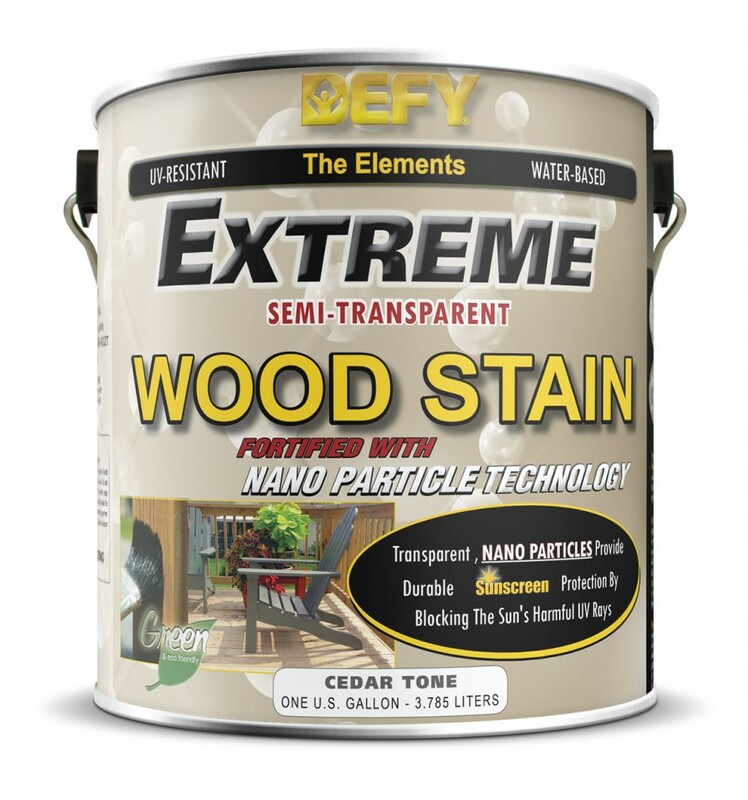 Defy Extreme Stain blocks these damaging rays keeping the wood looking new by preserving its appearance. We appreciate our community of deck stain enthusiasts here at Deckstainhelp.com as we continue to add content and serve as your go-to source for the latest in deck restoration news and trending topics through 2019. In this article, we talk about the different categories of deck stains and what sets them apart. As always, comments are encouraged below. Many people ask what types of deck stains are available when curious about deck care and maintenance. Deck stains, in general, are for preserving and protecting exterior wood. They provide water repellency, UV protection, reduce fungal growth, and enhance the natural beauty of the wood. In 2019 deck stains come in several types of opacity levels all having pros and cons. A coat of a solid deck stain completely hides the wood grain by creating a heavily pigmented film on the surface similar to paint. These come in any color imaginable and are available in both water-based and oil-based formulas. Cons: Do not penetrate well and are prone to peeling. Little chance of ever going back to natural wood look. Looks like paint. Hard to apply and prone to peeling. We welcome you to Deckstainhelp.com, where people come to share their knowledge and insights about deck staining in 2018. Please see below for some information that sets the record straight when comparing water based stains with oil based stains. As always, comments are encouraged below. A long debated topic is that of water based vs. oil based deck stains. Which one is better to use and will provide the best protection for a wood deck? Actually, there are advantages to both water and oil based deck stains even though they do have some major differences. Both types of stains can provide a beautiful long lasting finish on all types of wood. Both water based and oil based deck stains help reduce water intrusion and UV damage to increase the longevity of the wood. Oil based deck stains have been around the longest. Oil deck stains can preserve and enhance the wood’s natural color. They help to inhibit mold and mildew growth, which can lead to wood decay. Oil based deck stains naturally shed water to help prevent warping, cracking, and splitting. Most oil stains are low VOC formulas that are compliant in most states.